RF Cafe visitor Cris Schulze saw the Design News article I linked to titled, "EMI Emissions Testing: Peak, Quasi-Peak, and Average Measurements," and has given permission to reprint his brief response to it (originally posted on LinkedIn). 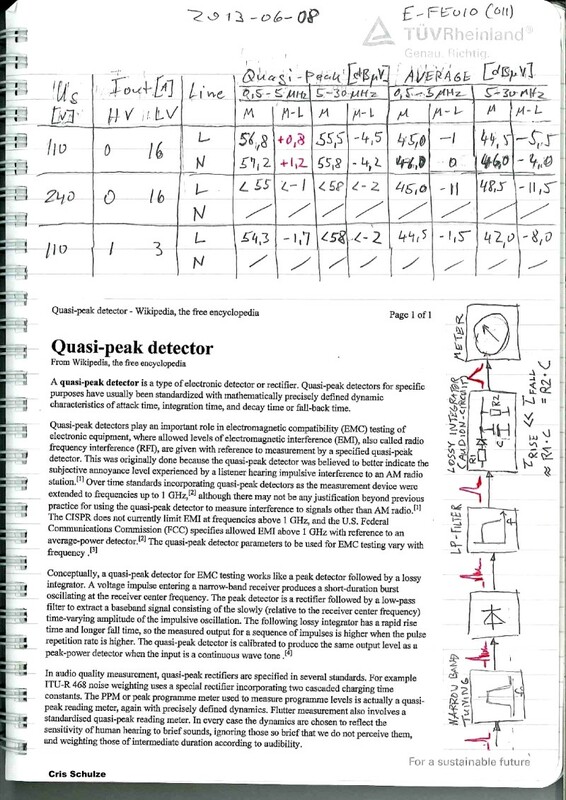 The included notebook image includes an excerpt from Wikipedia's quasi-peak detector page, and he illustrates a block diagram of the test chain with de Forest's audion circuit that provides the fast rise-time and slow fall-time that characterizes it. 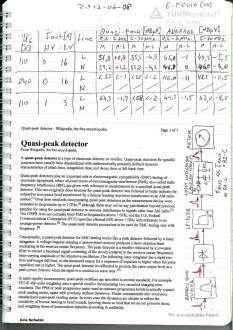 A table of actual test data compares quasi-peak measurements to average measurements. "Not really sure it is helpful, but I will share my technical understanding here. While the RMS is a measure of the real power, i.e. the equivalent thermal energy, of the signal, the peak value just describes the largest instant magnitude (the amplitude) within a certain time range - which makes it a bit difficult to measure. A bit more complicated is the quasi-peak measurement. The peak measurement tries to detect the highest value, even of very narrow pulses - which have quite low energy. But the pulse duration will have an effect to the disturbance of most systems, thus the peak value alone will be have little meaning to most real systems. Then the peak values will be formed, rectified to DC and integrated by a specified low-pass filter, thus the resulting "quasi-peak" value will be higher for wider pulses and smaller for shorter pulses. Then a quantitative value is generated which allows to compare the noise measurements of any system. Most important is the so called audion-circuit (named by Lee Deforest in 1906 - I think) which allows a quick charge and a slower discharge of a capacitor and significantly determines the deflection of the voltmeter connected to it. " Director Technical Competence Center at TÜV Rheinland Japan Ltd.